Matador contributor Deanna Niles McConnell offers suggestions on using foods as natural, affordable remedies for common irritations. If you travel enough, you will inevitably need some kind of first aid. Smaller issues and illnesses are usually no big deal for the well-prepared traveler and a real first-aid kit is invaluable, but what if you get a minor sweat rash under your money belt? Maybe a rogue TSA agent stole your favorite skin cream? Or maybe your budget is tight enough that you’d really rather not buy a tube of the local cure-all ointment. If you find yourself in need of some comfort from minor ailments that don’t require professional medical attention, here are a few cheap, easy ways to turn food into your personal paramedic. If you’re lucky enough to stay somewhere that includes single-serving packets of honey as part of breakfast, snap a few up – you’ll use them. If you’re in a colder climate and experience windburn or chapped skin, spread some on your face and rinse off for a rich, moisturizing skin-soother. It’s also great for burns and sore throats. 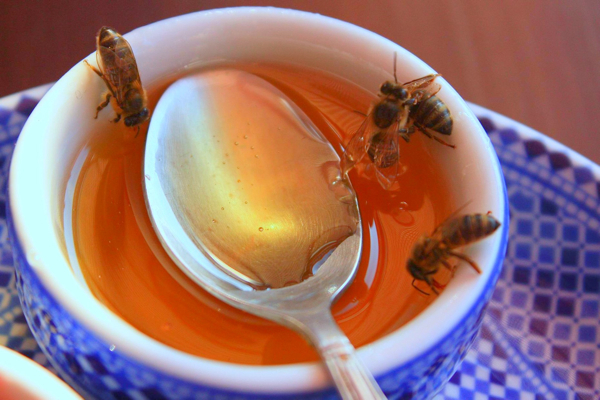 And for long-term trips, take a spoonful of locally made honey daily to assist with allergies. Naturally calming, good for relaxing at night, and tasty – that much you already knew. But it’s also great to add to a bath for sunburn. Soaking a washcloth in chamomile tea and applying it to the skin is a good way to help with yeast or heat rashes; let it sit on the skin and dry well afterward. Make sure a few tea bags are in your first aid kit – the cheap kind will do just fine! Yeah, it smells, and if you use it raw, it’s possible that nobody will want to sit next to you on the bus. But crushed or minced and applied to the skin, it fights athlete’s foot. It stings a bit and those with sensitive skin should dilute with water, but you can use a paste for toothaches, infected scratches, and to help combat salmonella. And depending on where you are, it can be inexpensive: the local farmer’s market near me sells large bulbs at two for a dollar. Ginger is essential for motion sickness and nausea. In a tea or even snacking on shaved ginger, it is useful for breaking up congestion and as an expectorant. Ginger dishes and candies are popular in a lot of places, so while it may not be as cost-effective as true digestive medicines it’s also a good way to sample some local delicacies while staving off the more unpleasant intestinal effects of travel. And it’s a heck of a lot tastier than Pepto tablets. Loaded with potassium, bananas are good for athletic trips with lots of walking, running, or climbing. It’s also part of the BRAT diet used to combat diarrhea (bananas, rice, applesauce, toast). But hold on to the peel; a banana peel reduces itching and stings from insect bites, and you get a snack out of it too. Use a bandage to hold a piece of the peel in place over the affected area for a while and it will reduce the inflammation and itch. And if you have a splinter but forgot your tweezers, secure a piece of peel to the splinter overnight with a bandage; the peel will draw the splinter up to the surface for easy removal.